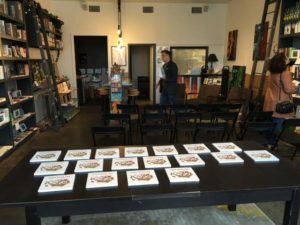 The OPOSSUM Texas debut event at Deep Vellum Bookstore in Dallas went swimmingly. It was supposed to start at 4, but by then only three people had showed up, so we waited, and by 4:30, we had a full house of 35 or so attendees and they continued to trickle in after we started. Of these, most were local writers. Kimberly Alexander, the local artist/dear friend who contributed the cover art and was the mind behind this event, came up with some brilliant ideas as we waited for the room to fill. Our first idea was to hand everyone an issue so they could reference it during the discussion (option to buy at end of event). People really seemed to appreciate this gesture and most ended up leaving with their copy. The second ideas was for Kim to select, from the amazing writers in attendance, people to read poems and excerpts of prose from the issue. Both of these impromptu decisions were very successful. Some reading highlights— Jane Baldwin read Albert Alexander’s interpretative flash essay on “Two Bullets,” his mom’s striking cover painting, with great emotional intensity. Joseph Milazzo read Pamela Murray Winters poem, “Big Snooker,” as if it were his own. Paul Koniecki donned a black hood to howl out an excerpt from Allison Bulger’s story, “Darker, More Real” and found his inner Soul Brother Number One in his reading of Adrian Potter’s “The Gospel According to James Brown.” Kendra Greene absolutely channeled the voice of a young Melissa Stephenson in her reading from “Bob Dylan Rule.” All readings were truly excellent. After the readings we conducted a very audience-interactive conversation between me, Kim, and Ashton about the journal’s inception, mission, selection process, and rumination on specific pieces in this issue. Among the highlights of the conversation was a segment where audience members and panelists shared stories of first encountering (stealing) music that was formative to our adult passions. Lisa Huffaker stole the show with a tale of snatching a glimpse of the wilder world (she grew up in a strict Mormon household) from one half of a shared set of earphones playing Thelonious Monk on a school-bus ride. Another great audience share was by musician Jimmy Baldwin, who described seeing James Brown arrive in a limousine on the turf of the old Cowboys Stadium, be frocked by his “cape man,” and perform exactly as described in Adrian Potter’s poem. Deep Vellum is one of the finest little bookstores I’ve ever come across, and I’m an aficionado of the small local bookstore. Tanya Wardell was an incredibly gracious host, and Anne Hollander was equally kind and supportive of our journal when I met her the next day to procure a set of Lisa Huffaker’s “Zine Machine” offerings (a dozen tiny literary journals dispensed from an old baseball card vending machine!). Will Evans made it all possible and I can’t wait to meet him when we do it again. If anyone is looking for Christmas presents, Deep Vellum Books, the non-profit sister of the bookstore, is one of the country’s foremost publishers of translated international literature and they offer a nifty subscription where you or your loved one get each month’s new book for a great bargain price. They offer a variety of subscription levels, and you’re supporting a truly grand literary organization. The saying is that “Dallas is miles wide, inches deep,” but from what I experienced this weekend, there is no finer collective of artist and literature enthusiasts in this country. Kim Alexander believes that art has to be activated by community, and that’s what they’re doing. I think that in places like Austin and Portland, art is sometimes treated as a commodity that pours from a tap when a knob is turned, but being in Dallas reminded me that art comes from individuals slaving away in rooms that could be anywhere, but only approaches Planck Temperature when stoked by a community that understands its preciousness. It was an honor to be welcomed with such sincerity into their world for an afternoon, and an unexpected boon for the oft lonesome OPOSSUM to meet so many new friends. Jon and Becky weren’t there in person, but everyone was thankful for the group effort that created this journal. For those of you who couldn’t be there, if you want to order your own copy by Tuesday December 20th we’ll Priority Mail it to you in time for Christmas! Visit our online store here!